A.P Govt. released G O No 109 on 24th May, 2018. 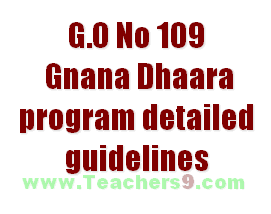 As per AP GO No 109, Conducting “Gnana Dhaara” programme in residential Mode during summer vacation from 28th May, 2018 to 9th June, 2018 in respect of students transitioning from Class 5th to Class 6th and from Class 9th to Class 10th (with D1 and D2 Grades) studying in Government, Government managed schools and all Residential Schools and also to conduct remediation year long programme in the form of Gnana Dhaara Learning Enhancement Program(LEP) to students from Classes 2nd to 10th from 15th July, 2018 to 31st March, 2019 - Orders – Issued. Adequate safety arrangements/security shall be provided to the students. All precautionary measures to be taken to avoid untoward incidents. In case of any incident occurs, it will be viewed seriously and action will be initiated against the responsible persons as applicable under disciplinary proceedings.